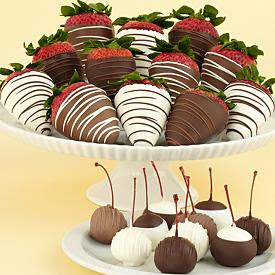 These chocolate covered strawberries look so yummy! It's very seldom that I crave for something sweets like this but because I've been looking at that picture for quite a while now I guess it somehow awaken my sleeping sweet tooth. How I wish I can grab one now but my oh my it's 12:33 AM and I know there is no way I can find that at this very time. So I guess I'll just have to satisfy my self with my capuccino coffee to which I added some sugar and sprinkled chocolate for that extra sweetness! Ooohh...chocolate covered strawberries...perfect combination! Yummy!! !